I had never heard of King Ranch Casserole until I was perusing my new Comfort Food Makeovers cookbook from America’s Test Kitchen. This traditional Texas casserole takes corn tortillas, chicken, spiced onions and tomatoes, then smothers them in a cheesy, creamy sauce before baking it all in the oven. How could that be bad, right? 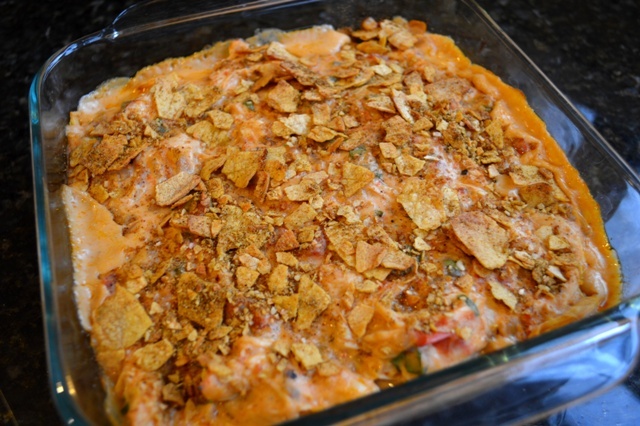 As the proverbial icing on the cake, the dish then gets topped with crushed Fritos bringing the final calorie count to about 630 calories a serving. Delicious, but worth the guilt? 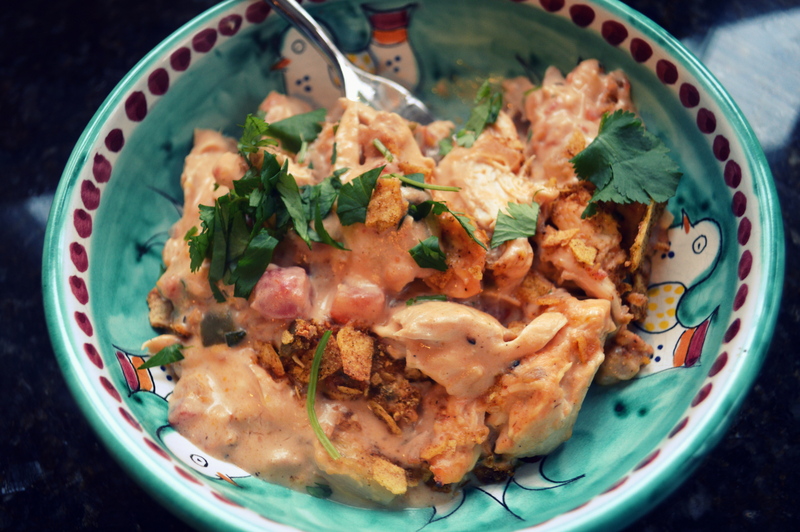 This lightened version was my first experience with the dish, and it was creamy, spicy, and incredibly flavorful. I find myself thinking that to mask this dish in loads of cheese, cream, and chips as originally “intended” would not only taste like pure junk food, but would also make your stomach turn flips! I’ll take my 380 calorie version instead! Start by preheating your oven to 450 degrees and adjusting your oven racks to the upper-middle and lower-middle positions. Spread the corn tortillas over two baking sheets, spray both sides with vegetable oi spray, and bake until crisp, about 10 to 12 minutes (flipping them halfway through). Allow to cool. Pulse 2 toasted tortillas in a food processor with granulated garlic, chili powder, and 1/2 tsp of salt until coarsely ground, about 12 pulses. Break the remaining 8 tortillas into bite-size pieces – set aside. Heat the canola oil in a Dutch oven over medium-high heat until shimmering. 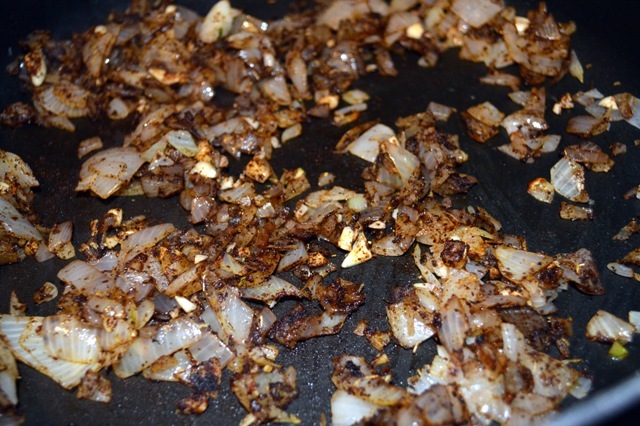 Add the chopped onions, jalapenos, cumin, and cook lightly until browned, about 6 minutes. 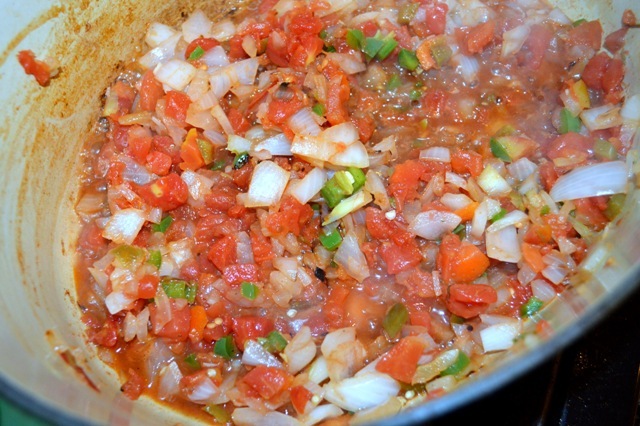 Stir in the Rotel tomatoes with their juice and cook until most of the liquid has evaporated, about 8 minutes. If you can’t find Ro-tel tomatoes, substitute 1 (14.5 oz) can of diced tomatoes and 1 (4-oz) can of drained, chopped green chiles. Stir in the flour, 1/2 tsp of salt, 1/2 tsp of pepper, and cook for one minute. Slowly whisk in the chicken broth and bring to a boil. Reduce the heat to medium-low and simmer until thickened, about 3 minutes. Add the chicken breasts and bring to a simmer. Reduce the heat to low, cover, and cook until the chicken registers 160 degrees, 10 to 15 minutes. Transfer the chicken to a carving board, let cool slightly, then shred into bite-size pieces. Off the heat, stir in the cream cheese and Colby Jack, a handful at a time, until melted. 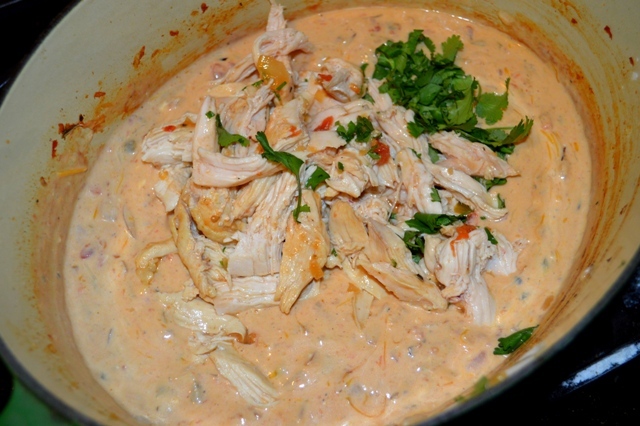 Stir in the cilantro and shredded chicken. 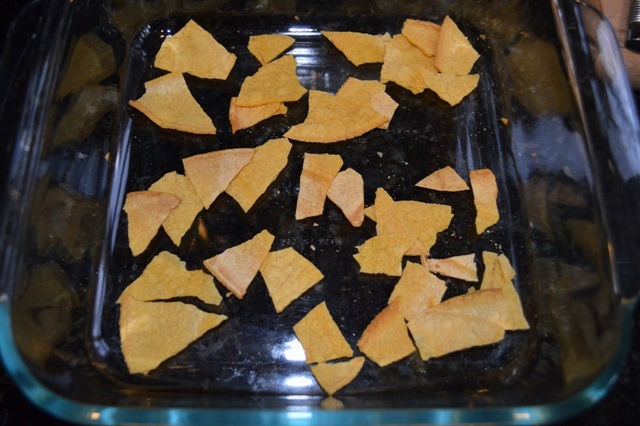 Scatter half of the bite-size tortilla pieces (not the seasoned ones) into a 13 by 9-inch baking dish. Top the tortilla pieces with half of the chicken mixture, then repeat with the remaining bite-size tortillas and the remaining chicken mixture. 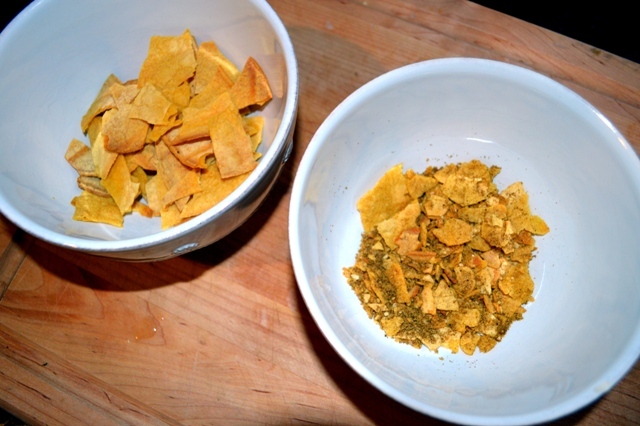 Sprinkle the dish with the ground tortilla mixture over top and spray the dish lightly with vegetable oil spray. Bake on the upper-middle rack until the sauce is bubbling around the edges, about 15 to 20 minutes. Let cool slightly before serving.